We play our home matches at the Aspray Arena which is located in Noose Lane in Willenhall, part of Walsall the heart of the Black Country. We’re located between Wolverhampton and Walsall, about fifteen minutes drive from junction ten of the M6. 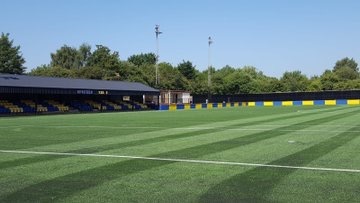 Once the home to Willenhall Town, the ground has seen huge amounts of work and investment over the last five years or so. In addition to the revamp of the club and bar facilities to create the 442 Bar and Lounge, a community sports facility has been created, known as the Black Country Performance Hub. The aim is to create a multi-sport facility for the whole community in Willenhall, offering a range of sports and leisure activities. In 2017, the club announced ambitious plans for a £1m transformation of the playing facilities with a new 3g pitch, grandstand and changing facilities. The club were awarded a £579,564 grant from the Premier League & The FA Facilities Fund towards the project as well as £75,000 from Sport England. The organisation worked alongside the Football Foundation and the Staffordshire FA to compile a five-year Football Development Plan, which is a vision of how sport will be played on site with an emphasis on increasing participation. Across users, it is hoped that the upgraded surface will support the creation of 42 new teams – a number of which would be within Sporting Khalsa FC. The club hope to grow from their current 17 teams to a total of 24, with new sides in a range of age groups. This will help the club to provide a complete player pathway, for both male and female members. This work was completed in the summer of 2018 and the ground officially reopened. On match days, both the 442 Sports Bar and Lounge – famous across non-league foodball for the Punjabi food – and the new food kiosk are usually open, meaning you’ll have no problems getting a bite to eat and a drink. A large car parking is provided but it can get busy – particularly as it is also used by the Black Country Performance Hub – so please do be considerate to our neighbours if using on street parking near to the ground. The nearest main railway station is Wolverhampton with services all over the county. Adjacent to the railway is the bus station and the 529 service running every ten minutes (and taking perhaps ten minutes or so during the day) has a stop at the end of Noose Lane. From there it is a five-ten minute walk along Noose Lane to the Aspray Arena. Come off the motorway at junction ten of the M6, heading onto the A454 Black Country Route. At the third junction come off the A454 down the slip road and take the second exit at the roundabout onto the A454 Keyway. Continue for about a mile until you reach the junction with Neachells Lane (there’s a Shell petrol station on the right). Turn right at the traffic lights onto Neachells Lane and after about 600m on the right turn onto Watery Lane. Follow this for about 400m until you reach the end of the road and the mini-roundabout. Turn left and the Aspray Arena stands before you on the left in all of its splendour.